Two days ago, as I write this, Mayor John Tory accompanied by TTC Chair Josh Colle and TTC CEO Andy Byford held a press conference at the unlikely location of Kennedy and Progress to announce the next wave of service improvements funded through the 2015 Operating Budget. Yes, this is the same Mayor Tory whose campaign rejected service improvements out of hand, not to mention the fact that they were not his idea, but Olivia Chow’s, his rival. Presto Chango! Candidate Tory becomes Mayor and discovers that his predecessor Mayor Ford has stripped the TTC of valuable service. Maybe we should put it back, he declares, and so, golly gee, come June 21 much of what was lost will now be found on many streets of Toronto. As an extra bonus, there will be more night service! Champagne all around! Well, maybe in small glasses. A City requirement for a 2% efficiency reduction in the net Operating budget (approximately $10-$11 million for TTC and $2 million for Wheel-Trans). Council has never passed any direction that agencies reduce their budgets (which in the TTC’s case means its subsidy requirement). The TTC will require at least $100-million more to operate the system in 2016. This must come from subsidy, fares or some combination of the two. Mayor Tory seems happy to use the TTC as a backdrop for self-promotion even though budget and service decisions actually rest with the TTC Board and with Council, but is careful not to mention that the TTC could actually face a funding cut in 2016. Part of the cost for new buses will show up in 2016 and will be funded, under current plans, from fares again. However, there is a limit to the amount of capital spending that can be sustained from the farebox considering that the TTC’s annual capital budget (excluding special projects such as subway extensions) run to $1-billion or so, roughly the same as all of the fare revenue. The costs shown for many items above are partial year costs. For example, the service improvements that will come into play in September will only operate for 4 months in 2015, but for 12 months in 2016 and beyond. Money to pay for full year service has to come from somewhere. The sad and outrageous truth is that Mayor Tory is happy to bask in the warmth of publicity for better transit service, but his budgetary goals work in utterly the opposite direction. 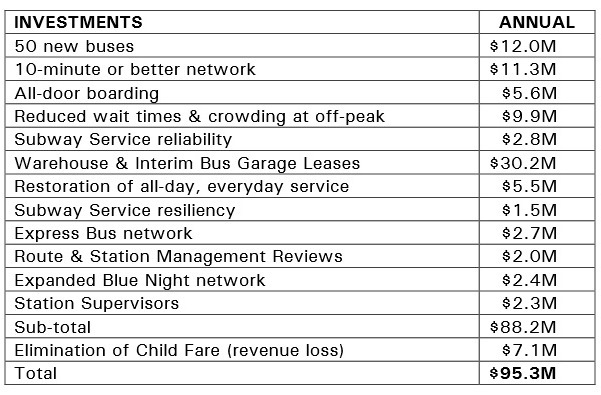 In August 2014, CEO Andy Byford produced a report listing all of the possibilities for improving the TTC together with their cost. For his troubles, he was the subject of vitriol from, among others, the Tory camp who felt the TTC was endorsing Olivia Chow’s transit platform. Almost all of the recommendations subsequently became TTC and Tory policy. The TTC Board should insist that Byford produce budget options that don’t acquiesce meekly and implement the Tory cut, but actively show what could be achieved if only the TTC had better funding. That’s what the TTC Board and its Chair are supposed to do, not simply to provide a photo op every time John Tory wants publicity. Steve – While I agree that Mr Tory has changed positions, I would put to you, that the voter is the one who is really at fault. People do not want to hear a big problem is solved by a thousand little things. They want big, bold solutions, things that can be called vision. Suggesting a couple of extra garages and a couple of hundred buses does not sound like a transit vision (although it does go a long ways towards a transit solution). If he were to merely suggest that the planning had been done by those that knew what they were doing, and it was time to merely implement, he would have been attacked for a lack of vision, a lack of real solutions. I have to admit this change in Tory’s position (quietly adopting his opponent’s platform) was really what I was hoping for. If he can keep moving this quickly he may even find his way back to supporting the DRL. I suspect that when the time comes (2016), he will find a way to help the TTC get money for more buses, while still claiming increased efficiency – those artic buses and larger streetcars mean more capacity and riders per driver, better/more service provided per unit of labor. Yes, we spent more money – but look how much more we got for it. Pushing for improved signal priority will also net improved efficiency – and better service, a little extra work and money with substantial dividends. I hope he can find a way to push for cost containment and improved service by being a smart investor and manager instead cost cuts through simply being angrier and nastier. I keep hoping he will see the way to efficiency through dedicated rights of way, by-pass lanes and signal priority – squeezing the most from the current buses and drivers, while vastly improving service. Pushing the TTC for a real headway management/dispatch system. A well planned tweak here, and nudge there, improving service while containing costs by improving management and the operational environment. I am still hoping he is a managerial conservative (red). The previous angry approach should mean that there are many an efficiency to be had – by investing a little, and putting a couple of extra buses in services, and focusing on management, that the simple acting of cutting would have left on the table to be had. Steve: Yes, but at the end of the day, Tory is using the TTC which should be responsible for planning and advocating for better service, as a prop. What is the purpose of the board and the staff? Proof for my claim is in the CBC link. Steve: That may have been the case on May 4 when that piece was written, but the announcement today is quite clearly for LRT. The TTC should take a page from the Police Service’s book and simply return a budget that includes 3-4% increase. Hey, it’s always worked for the police. Aside: Tory has been such a disappointment, even for someone who suspected he wouldn’t necessarily be better than Ford. I have never seen a worse disconnect between espoused goals and actions, not even from the feds. We’re lucky that you know and share all of this context, and thus are able to justify the shots at Mayor Tory and others. Despite the relatively vast improvement of Mr. Tory over his predecessor, it all remains as a “carservative” council, and the majority remains firmly with head up the tailpipe, especially when it comes to having the same degree of user pay that the transit users pay out. Even a study of reinstating the Vehicle Registration Tax failed, I think c. 30 to 15. Yet if the annual subsidy/avoided cost is maybe close to $2700 per car per year, that’s a really large sum that equates to being able to do all sorts of transit things, even if only a third of it was ever clawed back. To have this fought for by the TTC and Commissioners would require real transit advocates, and I’m not so sure that the majority of what we’ve got on there now really is all that “hard” an advocate, eg. Scarborough Subway scheme that will again blight the system. I would argue, so long as his approach is to co-opt and champion the best ideas, and implement the best plans, as though they were his own (even when they are from another campaign) or those of his team (which they are sort of) all is good. He needs now to make a virtue of being flexible, and implementing the best ideas of all, he is in government, and needs to show good governance – which we should hope if he really does it will get him re-elected. I hope we can get beyond grand plan electioneering, and ask ourselves who will create the best teams and implement the best advice, and this should include making a political virtue of getting out this of the TTC and being the loudest advocate. This is really the best governance (right of left). He should now be making a show of his flexibility and readiness do adopt good ideas from all corners – even the TTC and its board, along with city planning. Steve: If you heard Tory’s interview with Steve Paikin, you will know of his dismissive attitude to criticism from two UofT profs about the wisdom of SmartTrack and the SSE. Learning does not appear to be in Try’s repertoire at least when it comes to his own pet project. I, for one, am sick and tired of hearing Byford say what great things the TTC could do with more operating funding. The guy claims he’s not scared to give honest advice, yet says SSE and LRT are equally viable and not even putting it into the context of the already inadequate operating budget. I think a lot of the savings will come from reduced overtime. The TTC will be hiring more drivers and maintenance staff this year. The new staff will go towards reducing the overtime costs on the TTC. This will help reduce the budget. Also when they increase service ridership may increase meaning a higher fare revenue. Also this year will see a surplus in the budget for the TTC based on the increased ridership coming from the pan-am and para-panam games. Let’s see what 2016 has in store but I doubt it will mean reducing service. Maybe some increases will be deferred a year or 2. But after service cuts in recent years and the increases this year I think we can wait a year or 2 for more. Steve: That’s not the point. First off, the TTC will at best break even from the Pan Am Games, and there is a special subsidy they will receive for operating all of the extra service. Revenue for 2015 is down from original projections because of the bad winter weather, and the current projections do not show a “surplus” for 2015 operations. Revenue from new services has already been factored into the projections. Second, we have been down this path before. Every budget, especially those close to elections, brings a call for more cuts so that tax increases can be minimized if not eliminated. Year two of the municipal mandate is no time to be looking for cuts when a supposed turnaround in transit fortunes is used as a springboard for mayoral publicity. We will be back to “we can’t afford that” within months as the City’s Budget Committee reveals its agenda for 2016. Not sure what the problem is here? As you pointed out with Ford, Chow is as much history as anybody, having been soundly routed by D. Ford of all people so why bring her into this? Whatever it is it is sure good news as ANY improvement in good news. Why not be somewhat happy, we actually have shovels in the ground for your LRT on Eglinton, a commitment for LRT on Finch and a new subway past York U. Happy days are here. We also get hundreds of new subway cars and 100’s of new fancy streetcars. Not enough though, you want even more in a faster timeline? As we know form the past decades life still survived the last twenty years without anything new in transit. There’s no need to hurry now. We got great new stuff being built now. Ford’s out so why be so angry and chippy? Steve: John Tory campaigned on a platform that included some less-than-kind references to Chow’s platform and, behind the scenes, an attack on the TTC’s CEO serious enough that Andy Byford openly talked about opportunities elsewhere. Now, it suits Tory to appear as the saviour of transit from the predations of the Ford era. It’s not “my” LRT on Eglinton. That line plus the Spadina extension predate Tory, and his own attitude to the Finch/Sheppard LRTs was at best tepid so that he could avoid fights with the anti-LRT faction. Likewise, the new subway and streetcar fleets were in the pipeline long before Tory. No, I do not want more vehicles faster beyond expecting Bombardier to deliver on the on their contract as promised. More streetcars on the heels of the current order would be nice, but let’s get the 204 cars we are owed. As for subway cars, we have far more than we will need until the 2020s thanks to a decision to prolong the TR car order which, by the way, props up the Thunder Bay plant with ongoing production. As for Ford, yes he’s out, and with luck his health problems will be overcome. His relevance to transit is in the past through the delays and distortions he brought to the political debates, and we must deal with those in the present. Tory had one set of priorities for transit when he headed Civic Action, another when he campaigned, and an uncertain, shifting agenda as Mayor. That is a legitimate target for comment and criticism. I wasn’t aware that John and Andy didn’t like each other. Now I wonder if Andy Byford will stay beyond is 5 years, or whatever is current contract is until. I wonder why John Tory doesn’t like Andy, especially when Andy is changing the culture at TTC. I thought Andy was doing a great job overall. Is there something specific that John doesn’t like. I know John took a shot at Andy over the numbering of the subway lines, which is minor. I talked to some TTC employees, and they have mixed feelings about Andy. Steve: Andy says things that conflict with Tory’s world view. We need the DRL (not as some far off idea that is shunted aside by SmartTrack). We need more bus service (a position Tory’s campaign denigrated). Freezing fares is a bad idea (Tory campaigned on no fare increase). Andy has stayed out of the Scarborough Subway fight, but at some point its cost is going to be so ridiculous that it will threaten many other critical transit projects. I am hoping that he is being defensive – and appears to go to great length to point to studies, and that state he would be a fool to ignore the outcome of the studies. He also goes to great pains to make sure that the route, and choice are on others. While he is adamant, he also allows himself room to call it a mistake later. He appears to be ensuring that he has lots of room to maneuver, as he was on carding (which in my mind needs to stop – you should not detain people without cause, and as a way of creating open discussion – I think it serves no purpose other than creating anger). I am not of the opinion that SSE makes a great deal of sense, his point with regards to funding here makes some sense. Although the way he essentially evaded the conflict with Smart Track issue was interesting, merely a quick – routing study for subway to deal with it -but very clear it still ends at STC – which would be preempting the study – to say the least. The link that is truly missing in my mind – and appears on that dream map near the end – is an east west link across the city much further north, although LRT could become this- there is also a need for a quick link joining the other lines of transit – although good luck figuring that out. Steve: His funding claims misrepresented the situation. Toronto Council opted for the subway. Queen’s Park (at least officially) said “we will support whatever you want” although behind the scenes they were up to their necks in plugging the subway too. The Feds just want to support the city, although their contribution isn’t enormous. Both of them said that any extra cost for the subway would be on Toronto’s dime. I don’t call that “support” for the subway option. “His funding claims misrepresented the situation. Toronto Council opted for the subway. Queen’s Park (at least officially) said “we will support whatever you want” although behind the scenes they were up to their necks in plugging the subway too. The Feds just want to support the city, although their contribution isn’t enormous. Both of them said that any extra cost for the subway would be on Toronto’s dime. I don’t call that “support” for the subway option. I would note that in the Paikin interview he mentioned the DRL as a 15 year project – which is interesting, in terms of your comment of a far off one, as I am not of the opinion that it could be delivered much more quickly than that as a top priority at this point – and one of the reasons I believe it needs to be a top priority. Especially if we are building load attracting subway extensions. His position on funding is interesting, because it is anything but clear what the behind the scenes position is on funding of other projects by the other layers of government. While QP claims it is whatever Toronto wants it moved first due to provincial changes. Federally well, I suspect that subway plays better – and the is what the funding is really about. The politics of backing away from funding subway are clear – less so with other options – even though they are better. Your important point, however, at least in my mind, is the cost of build and operations going forward, and what effect this will have on the balance of the TTC. The SSE especially with Smart Track or RER adjacent appears to fall into the same situation as the Sheppard subway – an expensive line that is not supported by real (as opposed to politically driven and biased) ridership studies that will be inordinately expensive to operate, when the reality of its operation becomes apparent. It is clear however, that Tory has positioned himself – including in the Paikin interview – to be able to take credit and avoid blame, which politically is a pretty neat trick – if you can make it stick. Steve: Yet another example of his private sector experience blossoming in the public sector. Really this is not the way a corporation usually run – as they would not survive, however, it is how a lobbyist can excel. You get what you ask for, and you claim success, it fails, and well that is the government’s fault. One of the reasons the originators of the ST notion should be looked at with such suspicion – many a good idea starts this way, but be aware they are really only throwing ideas out to see what sticks. With the federal fall election on the horizon, all three parties had better have some sort of ongoing operational subsidy for urban pubic agencies on their campaign platforms. However, campaigning for and actually implementing it are two different animals, of course. But don’t forget that all police form a brotherhood and are heavily armed with guns and while I cannot speak for anyone else, I personally would be afraid to say NO to them. So, unless you want to arm TTC drivers with guns, I would not be comparing them with the police. Steve: Whether the police (or any other group) is armed is not the issue, but rather than police budgets tend to fall in a politically untouchable category while transit is always ripe for cuts. The only reason Doug Ford “soundly routed” Olivia Chow is because he rode the coattails of his cancer-ridden brother at the last minute, availing himself, in part, of the public sympathy and managed to rally enough right-wing, don’t-you-dare-raise-my-property-taxes-one-more-penny-unless-it-directly-benefits-me-only faction that penny-pinching Rob Ford brought out from the woodwork and endeared himself to. Instead of Tweedle-Dum we would have gotten Tweedle-Dumber, cut from the same cloth. When Robbie made all those budget cuts and instituted user-pay fees across the city for all sorts of things that should, in my personal opinion, have remained “shared”, you will note he didn’t institute additional user-pay costs to maintain the Gardiner Expressway (used daily by some 400,000 vehicles = how many people?) but he and Karen Stintz DID cut back on the transit system (1.66 million fares per day = 830,000 passengers?) Logical? Sure, if you use the Gardiner to *drive* to your office at City Hall from Etobicoke…. Civic-mindedness, hand-in-hand with good fiscal management, both seem to have become quaint relics of a distant past. Are you **serious**? The TTC CEO practically GAVE the TTC Board, the Mayor and any incoming Councillor who can read a blueprint for how to maintain, improve and expand the current TTC vehicles and service – and he provided it FREE OF CHARGE, as part of his job. The problem, William, is that Mayors and councillors – unfortunately, it seems – have constituents who, over the past 4 years in particular, have been trained by a CHEAP Mayor that they deserve all the things they want – and FOR FREE because, you see, taxes are BAD. And Mayors and Councillors who like getting re-elected don’t want to argue with their constituents even when the latter are talking out of their hats (that’s supposed to be why there is a TTC BOARD to make decisions and recommendations to Council – based on research and thoughtful deliberation). Yes, 20 years after the original shovels were digging UNDER the ground for an actual subway on Eglinton City Planners and actual educated experts who understand city-building, transit, highways and the like – heck those people, it seems, need to have the personal approval of God himself not to be considered raving lunatics but any Mayor who has managed to convince enough voters that saving money is what it’s all about is himself elevated to the status of a god…. Yes, worth celebrating, but the big problem is that announcements like that are and have been too few and too far between for too many years instead of planned and regular – plus, as I stated before, “plans” can be cancelled on a whim by subsequent governments à la Eglinton West Subway in 1995 thanks to Mike Harris – even with the hole already started…. Wow – hundreds and hundreds and hundreds of vehicles – where on earth will they be parked? These vehicles are not going to be coming into town for years or decades: you can’t use a 25- or 50-year timeline to justify breaking open the champagne here! Have you actually ridden on any TTC vehicles during this time as more people pack on and service deteriorates or even disappears? Why is there this smug satisfaction with just hanging on with the bare minimum to save a few pennies here and there? Good transit COSTS MONEY. Good transit begets more passengers begets better transit begets even more REGULAR and even NEW passengers. Profitable businesses aren’t just satisfied with the status quo – they look to increase their market share because they benefit financially and, hopefully, the customers (“riders” for the TTC) also benefit from increased and improved options to get around. This city has been thinking small for far too long and unfortunately the people who make the decisions – Mayors, Councillors, provincial and federal representatives, whoever – have been able to get away with minimal action because not enough people are on the phone every day complaining about the current situation and how long their daily commute took to and from school or work and demanding that they change it. How is it that the CAA speaks out for those poor, poor, hard-done-by drivers but there is no champion for transit riders? Politicians and public servants should be those voices. And, again, good transit costs money but makes things easier in the long run for those who use transit as well as drivers when fewer cars are on the roads. And Toronto and GTA transit users – and not just Steve – need to be forcefully asking why they don’t deserve consistently good transit service each day and better transit systems on an ongoing basis. City of Toronto and transit riders in particular: Read Andy Byford’s August report for an idea of what’s needed and how to go about getting it moving; stop cheaping out and get with the transit program!!! (Sorry for the rant!) Dean G.
I would argue Dean, that honestly the problem is just as much that the city thinks too big, blows money on mega projects where they do not belong, and then does nothing with the transit that is really required. If the money for the Sheppard subway was spent on what and where it should have been, and the same with the Vaughan extension, Toronto transit would have been massively better off. Think of an LRT on Sheppard (or better Finch) where only 2km was underground, and then it stretched east as far Markham Rd or further. Think of the Vaughan subway extension only being a York University extension, where it linked to an LRT at Finch that headed west (and Vaughan could arrange their own linking LRT). Toronto has avoided doing the small doable/manageable projects and dreamed big. The city has focused on massive subway extensions instead of small incremental improvements, Waterfront East and Waterfront West LRT, would likely have a larger impact on overall property values than the Vaughan subway extension. I would put to you that for the cost of the Vaughan Extension – as being built, an extension to York, and the Finch West LRT could have been built, and left enough money on the table to do the Waterfront east LRT. The cost of the Sheppard subway, would have paid for an LRT to Markham Rd, and the inner portion of the Waterfront West LRT, and would have allowed a link to the ROW in the Queensway. The money still left over would have paid for the operation of a couple of hundred buses. Toronto needs to stop the mega project approach- going big once in a blue moon, and start building a larger number of smaller projects, and focusing on basic service – think small and act frequently. However, ten 300-500 million project do not seem to attract the votes or press that a single 3-5 billion dollar project does. The best fix in Toronto, now would be an increased bus fleet, and larger number of smaller projects – adding subway, only where the load would absolutely require it – looking at a full network projection (ie ridership goes where it logically would). I don’t think Andy’s stayed out of the Scarborough Subway fight; he’s played an enabling role. I suppose he could have been a bigger booster or detractor, but he’s enabled this farce to continue by allowing inflated ridership projections to be presented and pretending the LRT and subway are equally viable, and by not emphasizing the impact the subway will have on the operating budget. How can this guy be taken seriously when he says how much better the system could be but for a few extra bucks of operating money? Steve: To be fair, the ridership estimates are being done by City Planning, not by the TTC. Byford’s attitude is that Council has decided it wants a subway, and it’s his job to set things in motion to build it as quickly as possible. Yes, that’s “enabling”, but it was a direct vote by Council. Byford said at a Town Hall out in my part of town (South Etobicoke) that his people told him LRT and subway extension are “equally viable” and that he wouldn’t be afraid to object to subway if it’s not viable. Well, it’s not viable!! Maybe it’s understandable to not want to make too much public noise about the capital project at risk of getting fired, but it really angers me that the CEO is not putting the decision into the context of the operating budget. At best, he’s abiding council keeping its head in the sand, pretending like it’s a non issue that will be easily solved by the next generation. Steve: Until revised cost estimates and ridership numbers are in, Byford would be in a tricky position saying “the subway is not a good idea”. The question would have to be – will the ridership numbers be real or cooked? Will they use a realistic network application, and Tory allow city planning to back off artificially elevating the ridership numbers? If he does, it would allow a complete change in position for all, as “new” information would change the basis of decisions, and allow many to reverse field if they choose to (best route being much more expensive – for many fewer riders than previous forecast- should dictate at least a reconsideration of current direction). If this is the case, the province will need to make sure RER is pushed at speed. Well many think it can in fact be much better with additional operating dollars and some minor improvements. Improve dispatch, and I think many routes would have better service. I think if you increase the number of buses operating and again service – off peak – service could be greatly improved. If you could have dedicated officers to increase the enforcement for lane and turning restrictions, and again the system could be improved. There are some capital dollar projects that would also help, such as some ROWs, a better vehicle tracking, and signal coordination system, a bunch of additional buses, and such that would really help at peak, but well, it could be much better, just using the assets already there, with better coordination, and increased running hours. There are 3 distinct types of service in Toronto, peak, off peak, and overnight. They require different types of support – and greatly improving any represents an improvement to the service the TTC provides. Yes there is a huge need for some major capital projects to improve service in the future (which feels distant indeed) however, for many service could be improved in the here and now, by improving the reliability and frequency of service off peak.